Matthew was back and is almost done. 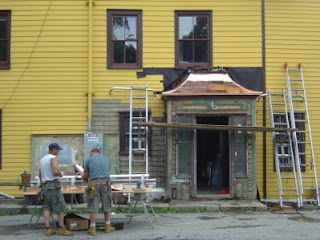 The copper makes the entrance look so much nicer, and once we restore the rest of the entrance it will look spanktastic. E! 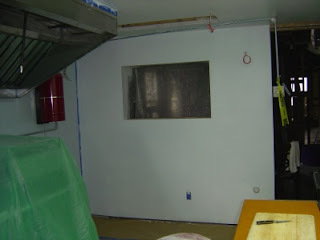 was busy painting in the kitchen. Soon it will be almost done (there are still a lot of little things that need to happen, fire alarm, fire suppression, etc.). I started rewiring the second and third floors. We still have old and brittle cloth wiring up there, and I am eager to get rid of it. Plus, the current wiring for the upstairs runs through the wait station, and we need to remove it, so we can wall up the wait station. 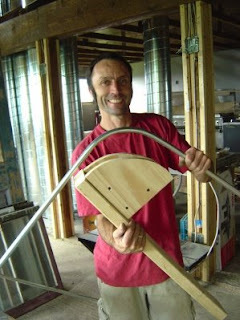 Here's yours truly with a handy tool for bending conduit pipes. I didn't see myself spending $20 on a tool I'd only use once, so I quickly built one. It works just as good. A man who makes his own tools is an impressive man, indeed!